If you've been following my social media, you know that I have been kinda all over the place since I left teaching in a brick and mortar public school. In the fall of 2015, I worked at a tech start-up in downtown Chicago, but then when we moved to Atlanta in early 2016, I found myself back in a classroom again. I wasn't in love with teaching in a formal classroom. When the school year was over, I started working for another start-up company. As 2016 was ending, I knew I did not want to continue on with the company. I started 2017, once again, all over the place. I have been apart of the gig economy. What's that? Basically taking gig jobs to stay afloat while I figured out my life! I have worked part-time as a health and fitness coach, part-time as a nanny, part-time once again for a tech start-up, and now, part-time as a teacher. Of all of my part-time jobs, this teaching gig has been the best. I get to create my own schedule: I get to choose when and how many hours I want to work. Within reason. Yes, these hours are either early morning or late at night, but I get to choose if I want to work. I get to choose if I want to open up more hours for last minute bookings. I get to choose if I want to make money on a Friday night instead of binge watching TV. While I figure out my life and what impact I want to leave on the world, there have been times I've been desperate for income and thought about getting a job at a store, restaurant, or taking the plunge and going back to a brick and mortar school or the corporate world. But deep in my heart, I know teaching in a classroom is not for me and working for someone else's start-up is not for me. And the thought of driving 30 minutes to make $10 an hour at a store... ugh, I can't do it. So this job has been perfect for me. It forces me to create a schedule for myself. I've lived way too many months without a set schedule. Not having routine and habits is AWFUL for your mental health. Seriously. No good. So instead of being lazy, this job forces me to get up and get started. And on days where I have to rush to my next part-time job, I can still do this one before I go there. Teaching online every day is my personal non-negotiable. I've read enough self-help books to know that what you do every day matters more than what you do once in a while. If you really want to change your life, you have to do something every day. So that's what I do with teaching online. I teach every single day, by my choice, but only for a little bit each day. It's like why I only workout for 30-40 minutes a day instead of going to 90 minute classes. I can keep up with the routine of doing something small every day rather than trying to do a crap ton but only a few times a week. I thrive on habit and routine. Habit and routine has changed my life. It's why I ran 100 days in a row! Let's get to the good part! How I made an extra $200 last week! My hourly pay is $20 an hour. 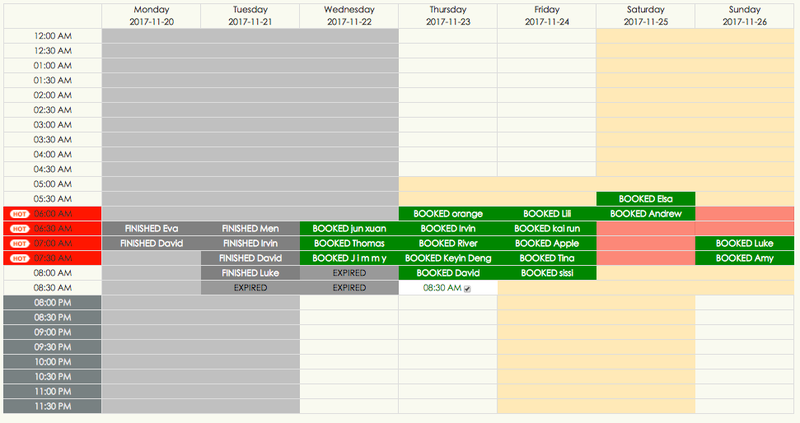 Take a look at my schedule for teaching from last week. It is my personal non-negotiable to teach every day for 1-2 hours. My sweet spot is 1.5 hours, but sometimes that can't happen because of things I have happening in my day. On Monday, I taught 3 classes. My hourly rate is $20 an hour. Or let's just say I make $10 a class. So I made $30 on Monday before 8am! Yes, I did have to wake up early. Again, LOVE IT. I am not a morning person by nature, so I have to do things to force myself to wake up. For a 6:30am class, I wake up at 6am. $30 is not a ton of money, right? But we will talk about the compound effect in a bit. On Tuesday, I taught 4 classes and made $40. On Wednesday, I taught 3 classes and made $30. On Thursday, I taught 3 classes and made $30. On Friday, I taught 2 classes and made $20. On that day, I opened up some more slots hoping for some last minute bookings, but I didn't get any extra. Is what it is. Still happy with my $20 from my kitchen counter! On Saturday, I had running club at 7am. I have been lacking motivation to run on Saturdays because the marathon is over, but I came up with this trick of FORCING MYSELF to teach so that I wake up early, am out of bed, and am ready to get to running club by 7am. No excuses. So I taught at 5am. Waking up at 4:40am was not fun, but present self is happy past self made that decision. I made $30 before heading to running club! Nice! On Sunday, we had a 5k race to go to, but I knew I wanted to teach, so I scheduled myself. $20. Not bad for an hour's worth of work from my kitchen counter! Ok, so what you do on one day doesn't really have a big effect on your life. Making $20 one day is really no big deal. Even making $30 or $40. Last week, I made $30 + $40 + $30 + $30 + $20 + $30 + $20 = $200. For 10 hours of work. No time spent on driving. No money spent on gas money. I was in my pajama pants. And it was before I started my other jobs/business. I can use that $200 to buy a flight to Chicago. To book a hotel. To buy some Christmas presents. To pay my student loans. Pretty sweet. Let's Compound Effect that $200 a week. $30 a day x 365 days in a year = an extra $10,950 a year. That's what I am thinking. YES. I will gladly wake up earlier in the day for an extra $10k a year. This is my schedule for this current week, so with 23 classes, I will make $230. Pretty good for working from my kitchen counter! What if someone wanted to make more money? What if they could do 2 hours a day instead of 1.5 hours? What are your student loans like right now? Could $14,600 pay for a good chunk of them? Can you push yourself to wake up 2 hours earlier in your day? Can you make it a non-negotiable to setup a routine in your morning so that future self has no more loans??? I work as a mentor teacher for the company. (Oh gosh, I have way too many jobs, but this one I love!) I will help you through the hiring process and send you the videos I used to get hired after just my first interview! The interview process can be up to 3 interviews, and it can take only a few days if you are serious about starting. One of my mentees applied last Thursday, interviewed over the weekend, and today, Wednesday, she had her first class! And I will send you all the info you need. Email me at jaclyn.ricchio@gmail.com if you have any questions.